Are you searching for new step vans? Used and price-conscious step vans? Step vans with a reputable warranty? Step vans ready for food truck upfitting? Step vans that are ISP ready? 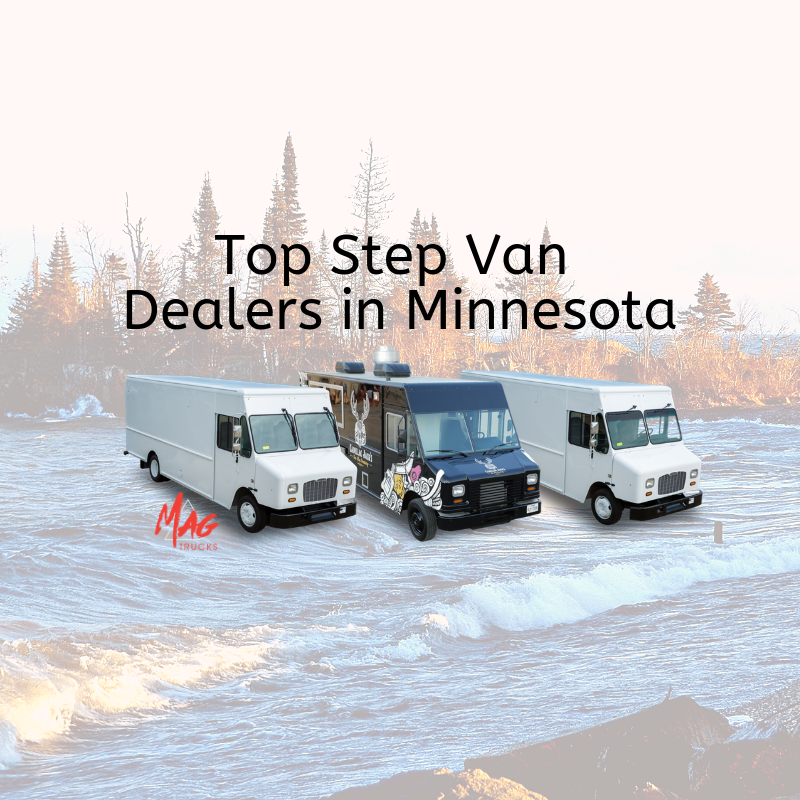 Check out this article on some of the top Minnesota step van dealers. Step van dealers can be found in many states but not all dealers are created equal. With the help of bloggerlocal.com, we’ve located a list of the top-rated and reliable step van dealers to narrow down the search time and effort. Below is a list of step van dealers that serve the Minnesota area. Here is a link to the article, “Top 10 Step Van Dealers, FedEx Box Trucks & Custom Food Truck Dealers” available on https://bloggerlocal.com/national/top-10-step-van-dealers-fedex-trucks-custom-food-truck-dealers. CommercialTruckTrader’s mission is to bring everyone who needs commercial trucks to the dealers who sell and lease them. We believe in supporting small business and civic needs through robust search capabilities while delivering an easy visitor experience. CommercialTruckTrader is a part of the Trader Interactive family of sites, which also includes EquipmentTrader, CycleTrader, and RVTrader. At CommercialTruckTrader, you will find the widest selection of classified ads with thousands of listings to choose from and dealers nationwide. CommercialTruckTrader is the leading online classified advertising service bringing commercial buyers and sellers together in one virtual marketplace. We reach over 1 million active commercial buyers a month through our website, showcasing a variety of light, medium, and heavy duty vehicles. CommercialTruckTrader provides dealers and independent owners alike access to commercial buyers who are interested in researching and purchasing new and used vehicles. CommercialTruckTrader is part of Trader Interactive’s network of websites covering new and used vehicle categories such as trucks, equipment, boats, motorcycles, ATVs, and aircraft, as well as general merchandise. This is the biggest new and used step van dealer in the country, with a significant customer base in Minnesota. MAG Trucks keeps a huge inventory of vehicles in stock at all times, offering a wide array of years, mileages, and programs that meet the demands of customers. From P500 – P1200, gas and diesel options, MAG is known for making the truck buying experience quick, and easy. Beginning in January 2017, MAG is under new management, and offers finance options for an all-in-one transaction. Check out their inventory – www.magtrucks.com. Located just outside of the Kansas City, Missouri area, this company serves businesses throughout the U.S.
As a company listed on this list, MAG Trucks has spent over a decade in business and continues to focus on top-notch customer service and a positive truck buying experience. From our in-house 50,000 sq. ft. fabrication facility to ISP guidelines, MAG Trucks is centrally located and equipped to easily deliver step vans nationwide within 7-10 days of purchasing. In fact, many of our repeat customers are located in Minnesota and find the experience with MAG to be such an easy and flawless process that the distance of delivery offers no deterrent when purchasing a single step van or fleet of step vans. In addition, the selection of the companies ranked on the mentioned list below offered a wider selection of both new and used step vans. This is a core differentiating factor between step van dealers and purchasing from eBay or craigslist. Secondlifetruck.com is an online marketplace that brings private seller, commercial truck dealers and buyers looking for truck together. Our classifieds are specialized for used comercial truck and vans in the USA and Canada. Our target is to create the space for easy buying and selling truck in any condition and mileage, free and quickly. Work Truck Direct offers customers the opportunity to purchase or lease a used or new work truck. Some of the brands include Hino, Mercedes, Isuzu, Freightliner, Ford, Chevy and a number of others. Their trucks are equipped to serve a wide array of industries from arbor and landscaping services to restoration and emergency services. Work Truck Direct is a licensed vehicle dealer and wholly-owned by the company AP Equipment Financing. The vehicles offered are sold by a number of dealers throughout the U.S. This company has an A+ rating with the BBB and is a member of the National Equipment Finance Association and the Equipment Finance and Leasing Association. Another step van dealer not mentioned in the BloggerLocal.com article, but may be a helpful resource is TruckPaper.com. This is an online hub for new and used trucks, trailers, and related equipment. The inventory is huge and mainly features used trucks from all major manufacturers, including Freightliner, International, Peterbilt, Kenworth, Mack, Isuzu, Volvo, Ford, and Western Star, plus hundreds of others – everything from light-duty to Class 8 trucks, including conventional sleeper and day cab trucks, bucket trucks, tank trucks, fuel trucks, van trucks, and more. For the full listing of all step van dealers, check out the article on bloggerlocal.com. If the team at MAG Trucks can offer any insight into the buying process, please us know. We have decades of combined sales experience focused on step vans. If we can help, please email sales@magtrucks.com, or give us a call at 800.888.4614.